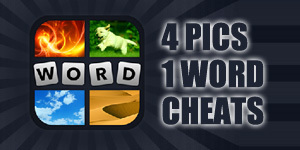 4 Pics 1 Word Cheats is the best fan community for the awesome photo word game, 4 Pics 1 Word. 4 Pics 1 Word Cheats has answers for every level, a word solver, and lots of admins that can help you find the answers if you need help. 4 Pics 1 Word has taken the word by storm and dominated all platform games in 2013. The concept is simple. You look at 4 pictures and find the word that each pictures has in common. Below the 4 pics, you get a set of letters that you will use to spell the word. The blank tiles above the letters indicates how many characters are in the word. It's a fun game for all ages and if you get stuck, you can find the answers to any puzzle here on 4 Pics 1 Word Cheats.